Definition at line 7 of file CREReportDefinition.h. Definition at line 3 of file CREReportDefinition.cpp. Definition at line 7 of file CREReportDefinition.cpp. References footer(), header(), itemDisplay(), itemSort(), name(), setFooter(), setHeader(), setItemDisplay(), setItemSort(), and setName(). Definition at line 16 of file CREReportDefinition.cpp. Definition at line 60 of file CREReportDefinition.cpp. Referenced by CREReportDefinition(), CREReportDialog::currentRowChanged(), operator<<(), and setFooter(). Definition at line 30 of file CREReportDefinition.cpp. 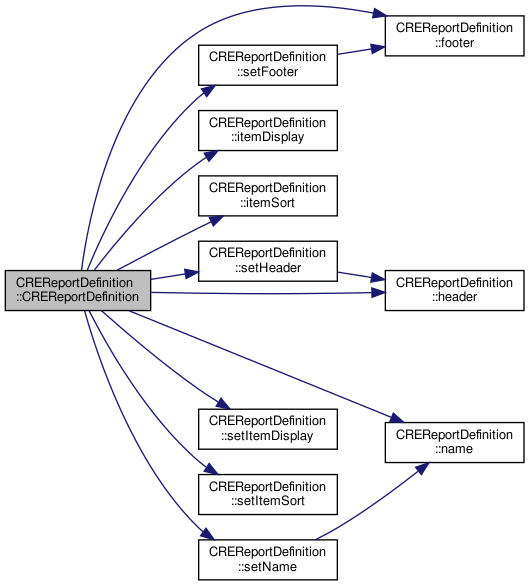 Referenced by CREReportDefinition(), CREReportDialog::currentRowChanged(), CREResourcesWindow::onReportChange(), operator<<(), and setHeader(). Definition at line 50 of file CREReportDefinition.cpp. Referenced by CREReportDefinition(), CREReportDialog::currentRowChanged(), CREResourcesWindow::onReportChange(), and operator<<(). Definition at line 40 of file CREReportDefinition.cpp. Definition at line 20 of file CREReportDefinition.cpp. Referenced by CREReportDefinition(), CREReportDialog::currentRowChanged(), CREReportDialog::onDelete(), CREResourcesWindow::onReportChange(), operator<<(), CREReportDialog::refreshList(), CREReportDialog::saveCurrentReport(), setName(), and CREResourcesWindow::updateReports(). Definition at line 65 of file CREReportDefinition.cpp. Referenced by CREReportDefinition(), operator>>(), and CREReportDialog::saveCurrentReport(). Definition at line 35 of file CREReportDefinition.cpp. Definition at line 55 of file CREReportDefinition.cpp. Definition at line 45 of file CREReportDefinition.cpp. Definition at line 25 of file CREReportDefinition.cpp. Referenced by CREReportDefinition(), CREReportDialog::onAdd(), operator>>(), and CREReportDialog::saveCurrentReport(). Definition at line 36 of file CREReportDefinition.h. Referenced by footer(), and setFooter(). Definition at line 33 of file CREReportDefinition.h. Referenced by header(), and setHeader(). Definition at line 35 of file CREReportDefinition.h. Referenced by itemDisplay(), and setItemDisplay(). Definition at line 34 of file CREReportDefinition.h. Referenced by itemSort(), and setItemSort(). Definition at line 32 of file CREReportDefinition.h. Referenced by name(), and setName().